There’s a quote by Marianne Williamson that is very popular with the “personal growth” crowd. You’ll find it on the wall of yoga studios and retreat centers. It is often quoted in sermons, commencement speeches, and by coaches and therapists for all manner of occasions. You’ve heard it. You may even have it memorized. “Our deepest fear is not that we are inadequate. Our deepest fear is that we are powerful beyond measure.” (from A Return To Love: Reflections on the Principles of A Course in Miracles by Marianne Williamson). Here’s the thing: she’s absolutely right. We humans — or at least an overwhelmingly vast majority of us — are terrified of our own power. And this fear, I believe, is the root of all violence in this world. “Power” is the experience of life flowing through us, as us, and is governed by love. 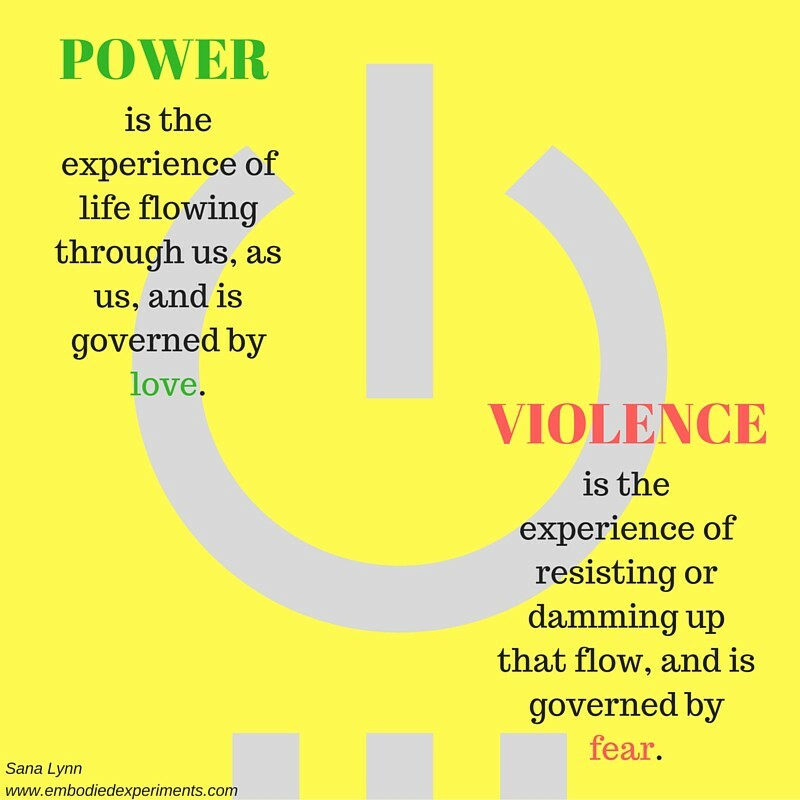 “Violence” is the experience of resisting or damming up that flow, and is governed by fear. I’m still playing with these definitions, in particular looking for a stand-alone definition of violence that I’m satisfied with… this week I’ve been thinking a lot about “flow” and “force”…so stay tuned for ever-deeper and more evolved definitions of this oh-so-important terms in the future. For today, it’s enough to say that Power and Violence are internal states-of-being that impact how we move in the world and what sort of effect we have on the world, and that power is free-flowing and life-generating, and violence does not flow and is life-threatening. And, as strange as it seems, given this understanding of what power is and what violence is, we fear our power. 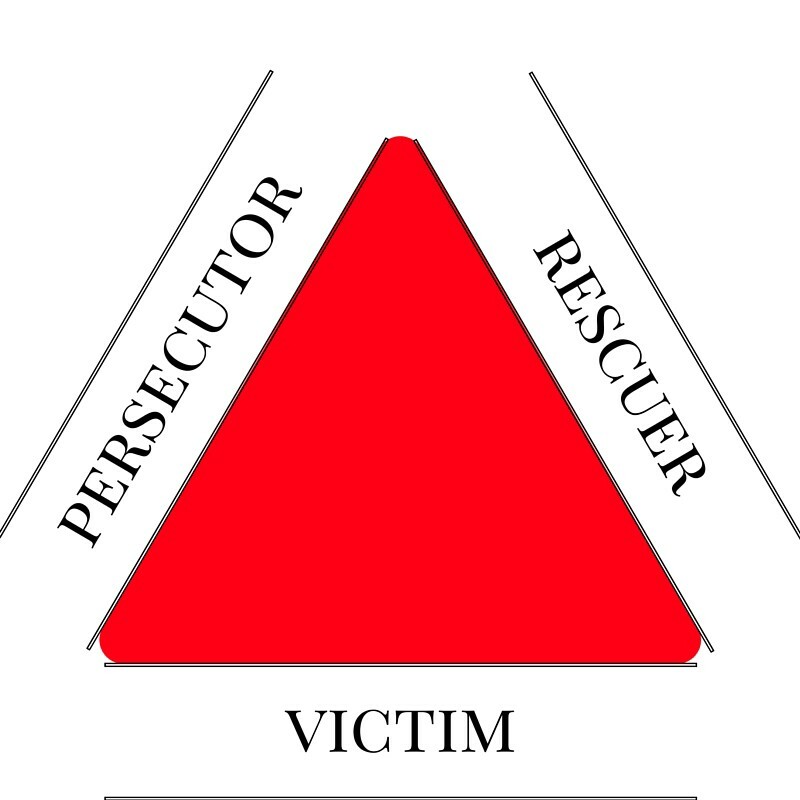 It is this fear of our power that traps us in the perpetuation of the Drama Triangle (pictured left) introduced in part one of this series. Now, if you’ve been following along, you might be a bit confused — haven’t I been asserting that either a resisting or clinging to fear is what perpetuates the triangle? You are absolutely right. The trick, here, is that these two assertions are essentially two sides of the same coin. Let that simmer; we’ll come back to it. But first, we need to talk about power, and why we’re afraid of it in the first place. I have this hunch that the original fear of power dates all the way back to the origin-story of the universe, and serves an essential purpose in the evolution of consciousness — to keep us from dissolving back into the One. But this idea is paradigm-dependent and I’ve not done nearly enough reading and thinking about it yet to present it to you, here. So instead of talking about the origin of our fear-of-power, I’m going to talk about why we’re afraid of it now, in this current day-and-age. Of course, the very simplest and most obvious explanation is that in a world full of violence, power is a threat to the status-quo. But if it were that simple, all of us who are unhappy with the status quo (which I think is probably most humans if not all, right now), wouldn’t share this fear; we’d simply surrender into our own empowerment and dance as the world changed around us. It goes deeper than “the world” being filled with violence. It’s in our cultures. It’s in our paradigms. It’s in our mythology. And it’s in our bodies — our very DNA. For at least thousands of years, and possibly for the entirety of human history, we have trained ourselves out of our own power, in celebration of an idea we call “identity”. See, I really do believe that fear is an ally. At its most basic level, fear is about containment of the I. It helps keep me intact. It is my protector from annihilation. Fear serves an essential evolutionary purpose and we need to not demonize it. But we do have some untangling and realigning to do around it. It’s the “I” that gets tricky. We humans tend to mix up what that word really means. Me make up stories about ourselves, and then we identify with these stories, calling them our identities, and thinking that they encompass the fullness of who we are. But these made up selves aren’t us — they are like the clothes we wear over top of our actual selves. And here’s the thing about Power: it burns away our identity-stories. The more I live into my own essential flow, the more I am stripped down to my essential self…the me that I am underneath all of the stories I made up to explain my life to myself. This is the nature of empowerment: it reveals us to ourselves. [Tweet This]. In that revelation, we become free to live as ourselves, and in living as ourselves, to live in harmony with the other selves. In other words, it gives us access to our bliss. But this process of story-burning is utterly painful. It is agonizing, because I have spent my life crafting an identity, as did my parents and grandparents before me. And I think that this identity, this story-with-which-I-identify, is me. In fact, I’m so convinced that this story is who I am, that the thought of it burning away terrifies me. This terror — the terror of losing my identifying narrative because I believe its loss to equal my own death — is at the root of the clinging to fear or resisting fear that cages me in the Drama triangle. Which is why I stated, above, that they are two sides of the same coin. Let’s have some life examples, shall we? This is feeling abstract. Example #1: I am an entrepreneur. It’s awesome. It means I get to set my own hours, work from home (or the cafe down the road where I’m currently sipping iced decaf and dipping french fries into avocado chimichurri), and, as long as my commitments to the firm I work with and our clients are met, answer only to myself. It also means that my paychecks, rather than arriving on a set schedule, arrive randomly according to the flow of work: sometimes a waterfall and sometimes a trickle. Recently, in a “trickle moment”, I noticed myself feeling afraid. So I stopped what I was doing, and sank into the feeling. I curled up in a blanket, away from distractions like the computer or phone, and let my body tremble. And as I shook, I noticed the stories I wanted to make up, to explain the fear, to make it better, to fix it. Stories about running out of money, about not having enough to pay my bills, or eat, or make it to the things on my calendar. And I refused to buy into these stories, naming them as the distractions that they were, from the experience of feeling my fear. Finally, I got to the identity-crisis that was hiding underneath the fear-stories. I saw that all of these stories were my way of clinging to my fear of scarcity. Why? Because if I let go of the stories of scarcity, I would have to let go of the story of my own aloneness. I have an identity-story, passed down in both my matrilineal and patrilineal lineages, and replayed and confirmed in my own life experience, about being alone in the world. I’ve done a fair amount of work around this story, so I was ready, in this moment, to spot it as the lie that it is, and step into the truth of the moment: that, on a deep level, I am an inseparable part of the fabric of all-that-is, and on a practical level, I am part of a network of family and friends, who would certainly not let me starve, or even have to miss out on plans together due to a shortage of funds. What happened, here, is that as I allowed my fear to shake my body and refused to hook into the surface-stories of what that fear was about, that very shaking provided the friction/heat that burned away another layer of the identity story — the aloneness story. That aloneness story is rooted in my own fear of my power, as power is inherently connected. You see, I’m terrified of my own power. But I’m also longing for it. So to trick myself out of letting my own flow, flow, I convince myself that I’m actually afraid of something else. But if I let even that made-up fear shake through me, I would touch the truth of my own power. This is the magic of allowing emotion to flow unobstructed through the body — it brings exquisite clarity in its wake. So I avoid feeling the made-up fear, either by resistance or clinging, to keep myself ignorant of the power of who I am. When I can subvert this process by letting my body experience my fear fully, and refusing to get distracted from my identity-level fear by the made-up fear stories, energy flows through my body and brings me with it into the flow of my own true power, and I come into greater clarity about myself. Example #2: For the last decade, I’ve been a member of a spiritual community that I adore. And, like all communities, spiritual or otherwise, it has its shadow side. Recently, I’ve been bumping into the shadow side of things more than I’ve been sunbathing in the light side of things in terms of this particular community. For years I’ve been doing the dance of “how does this shadow show up inside of me” and working it from the inside-out as best as I can…but while I’ve grown and changed, the strong emotional charge hasn’t dissipated, and I’ve not seen the community changing around me. This past spring, it all came to a head via a couple of different interactions that left me feeling furious. So I made some time and space, and let my fury move through my body. I screamed. I growled. I ranted. I hit a styrofoam cube with a tennis racket. In a contained environment where nothing (including me!) was in danger of being damaged, I let my anger get as physically big as it could get. As it passed through, I dropped into pain. My heart felt as if it was breaking in two. My sobs shook my whole body, my wails were deafening. I wrapped my arms around myself and let my tears flow. And eventually, just like the anger, the physical expression of heartbreak began to ease up. And as it passed, I began to tremble. I had successfully dropped all the way into my fear in the situation. And with the fear came the made-up stories…that I was afraid I would have to leave the community, that I was afraid I’d never be recognized or valued, that I was afraid my dreams would never have enough room to manifest. I looked these stories in the eye, and said to them, “I don’t know which fear you are covering, but I know you are not true, and I refuse to get distracted by you.” And I continued to feel my fear, to allow it to pass through my body. At this point, I was exhausted. I’m not going to lie — this feelings-in-the-body thing is hard work! But I’ve often found that it’s on the heels of my exhaustion that the clarity arrives; as if some combination of burning off illusion via the energy-in-motion of my emotions and wearing out the brain in the same process is what allows me a true glimpse of myself. This time, it arrived like a lightening bolt — these made-up fear stories were covering an identity story of non-belonging, and I was making up stories to avoid feeling the fear of that identity story. The story of my power is that I am an inseparable part of the fabric of all that is. As such, non-belonging is ridiculous. There is no way I could not-belong when I am an inseparable part of what is. Because belonging is a power-story, I identified myself with non-belonging in order to avoid my power. This is a more complex example, in that the fear was hiding underneath both pain and anger. And what arose from the process was also more complex. In the first example, I had only to drop the false-identity story of aloneness by feeling my fear of the aloneness fully. From that place, when I looked at the made-up fear stories of being unable to feed myself or pay my bills, the external “problem” revealed itself to be simply a matter of perception; the fears were unfounded. In this second example, once I allowed myself to feel the fullness of my fear of non-belonging and so drop the false-identity story around it, I again turned to look at the made-up fear stories. And from this place of clarity I saw that some of these stories were, in fact, valid — but that I no longer feared them. I may, in fact, choose to leave the community. I don’t know yet. But I do know that the dreams I’m currently dreaming won’t have space to grow if I plant them within that context. So, whether I stay or go, I will be planting my seeds somewhere else. And just as the first example brought me more clarity about who I am in the world, the second example brought me more clarity about what the world is to me. So, to recap: We are afraid of our own power, so we make up scary identity stories that are actually the opposite of our power-stories. Then, so we won’t see through our scary false-identity stories, we trick ourselves into thinking that we’re actually afraid of something else instead. Then, so we won’t let that fear move through our bodies and bring us into the power we’re so afraid of, we avoid feeling our fear, either by resisting the flow of things or damming up the flow of things, which brings us into an internal state of violence. To counter this, we feel our feelings in our bodies, refuse to buy into the stories we made up, see through the illusion to the truth, and glimpse the grace inherent in the entire situation. Flow is the whole thing. Every moment dies as the next one is born. We flow from life to death to life as we move from Now to Now to Now. If I cling to any moment, if I resist any moment, this flow is blocked. This clinging or resisting comes from fear. Fear has an essential evolutionary purpose, which it can only fulfill if I allow it to flow through my body. This embodied practice restores me to my own flow, brings me to clarity about myself and the world, and empowers me to live my purpose. Lots more to come about this process in the weeks to come…we’ve barely scratched the surface! In the meantime, I am so grateful for your questions and comments helping me clarify my thoughts on this huge and important topic, and look forward to more! This entry was posted in Uncategorized and tagged as within so without, embodiment, empowerment, fear, feeling, oneness, violence by Sana. Bookmark the permalink.